Burgers all day on Wednesdays! Enjoy our can’t-be-beaten burgers for $10.95, all day on Wednesdays! Available at all Spur Australia restaurants. Enjoy 1 Free Kids’ Meal from the Kids’ Menu per dining adult ordering a Main Meal from 11am on Mondays and Tuesdays! 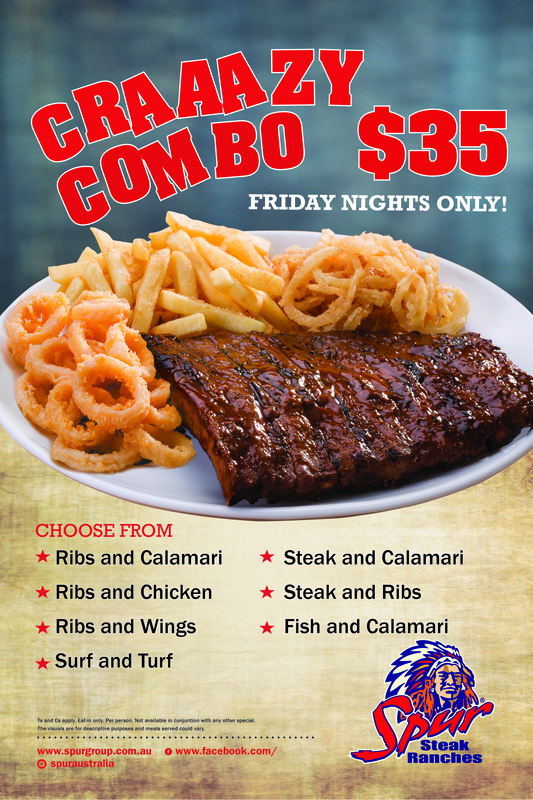 Enjoy our CRAAAZY COMBO's on Friday nights only! Crazy Combos at $35 each. Offer is available every Friday night from 17h00 to 20h30. Available at selected stores only. Have your Birthday Party at Spur! Interested in a Spur Franchise? © Copyright 2019 Spur Australia. All Rights Reserved.